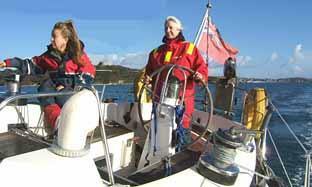 Enjoy a day sailing around the beautiful Falmouth waters during your time in Cornwall this season. The Falmouth Estuary is rich in maritime history and home to one of the largest natural harbours in the world. It provides a very safe sailing area in all weather conditions giving you and your family peace of mind at all times. On a days sailing with one of our fully qualified and friendly skippers you can explore the wonderful local creeks spanning of from the Falmouth estuary or enjoy a gentle sail around Falmouth bay itself. For lunch, you can anchor up and enjoy a short trip ashore to one of the many picturesque pubs at the water's edge or instead gently float around watching the many activities in Carrick Roads. We can accommodate up to 7 people on each of our sailing yachts. Families	are very welcomed and no children are too young to come sailing with us. From 0930 hrs Guests arrive at Freewinds. Welcoming on board from our friendly skipper.Tea, coffee, orange juice. 1430 hrs Depart for an afternoon of fun sailing.Our skippers will allocate individual duties such as helming, simple navigating and sail trimming. 1700 hrs Return to marina for prize giving and photographs if requested.